Arizona Cardinals' Big Red Plays Tennis with the USTA! In an effort to grow tennis in the Southwest, the USTA participated in the First Annual Phoenix Sports Explosion, hosted by the the Phoenix Women's Sports Association. On Saturday, September 29th, the Mayor of Phoenix proclaimed that day the first ever "Phoenix Day of Play", and sports associations from across the valley came together to get more of our community enthusiastic about the games that everyone loves. Soccer, basketball, lacrosse, water polo, fencing, baseball, golf, and tennis are just a few of the activities that hundreds of kids and adults played during the sports explosion. 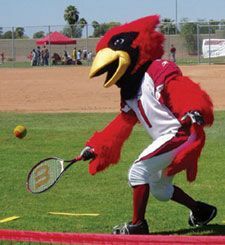 The	Arizona Cardinals' football team mascot, Big Red even joined the fun and played some tennis. Click here to see the pictures from the event.